← What is Marine Ich and How to get rid of it? 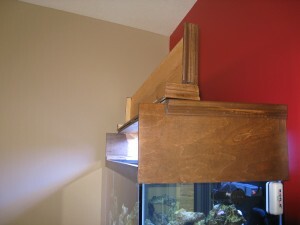 Building a custom aquarium canopy is a great option for anyone looking to customize their aquarium setup. The aquarium stand was a bit easier to build than the canopy, (you can check that out here) but we felt it was important to build it ourselves, not only because matching the canopy and stand would be aesthetically pleasing, but because being able to customize a canopy to the dimensions we wanted would in the end give us the space and look we wanted. The canopy houses all of the fans and lighting needed for the aquarium, keeping the entire operation hidden, yet attractive. 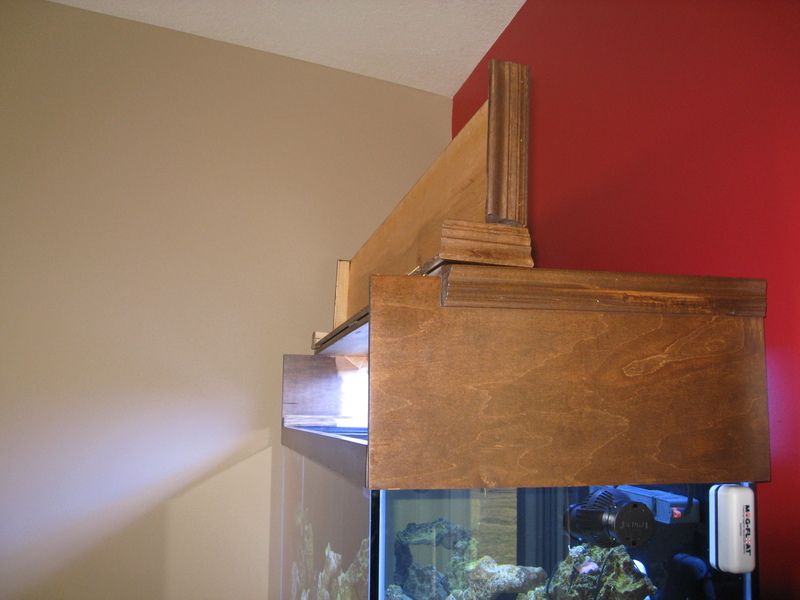 It has a flip up lid that allows access for feeding and maintenance, while keeping the lights angled downward into the tank at all times. Many canopies are shorter, making moving around in them, especially when changing equipment, and even feeding difficult. Keep this in mind if you are deciding whether to purchase or build your own canopy. It will save you a lot of headache later on. Check out our canopy pictures below. How would you customize your own canopy? 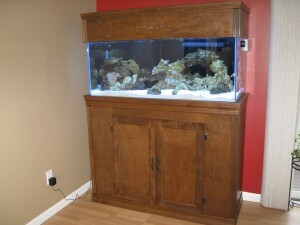 This entry was posted in DIY Components, Informational and tagged aquarium, canopy, Custom, diy. Bookmark the permalink. Hi there! The canopy measurements (outer measurements) are approximately 9 1/4 inches high, 50 inches wide, and 19 inches deep. 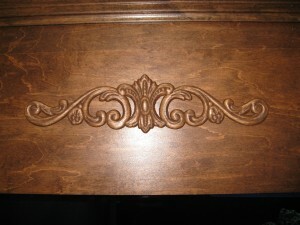 The hinges to lift the front cover are mounted 3 inches into the hood. 9 1/4 inches gives us plenty of room for the lighting and fan, as well as reaching in and out to feed and make any adjustments without being cramped. 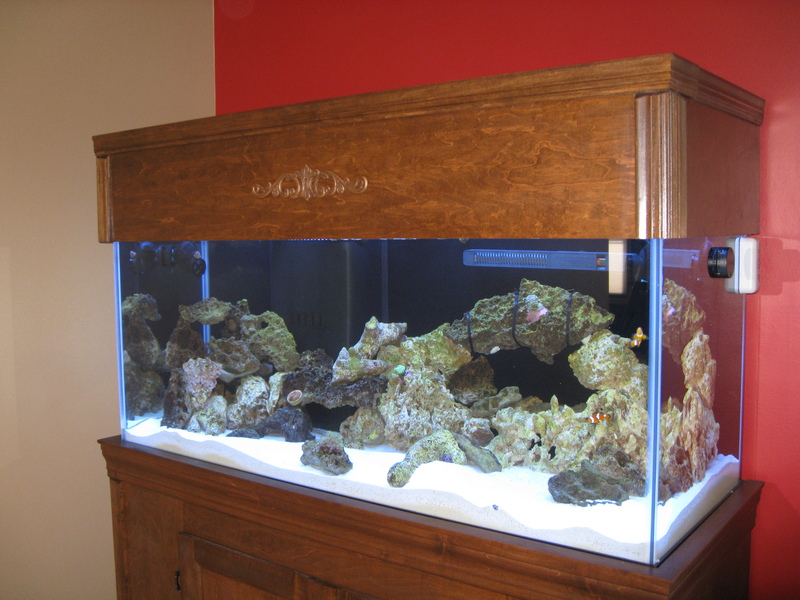 We love the height that the tank sits, because there is no bending down to look into the tank. People can walk right up to it and not crouch down to see everything. We are glad you like the tank! Let us know if you have any more questions. We can also scrounge up some more photos if you need them! Good luck!